Quality Feed & Garden is known for offering chicks year round. 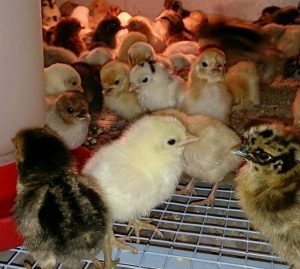 We sell chicks, ducklings, goslings, turkey poults, and guinea keets, adult poultry, quail, pheasants, pea fowl, pigeons, and doves based on availability. Small caged birds include parakeets, lovebirds, cockatiels, canaries, quaker parrots, and finches. We also sell feed for all the livestock we sell, care brochures and guidance, cages and supplies. Looking for a chicken coup? We offer Ware livestock cages, and offer a custom cage that can be delivered to your home!